Silkypix is a gold standard for the professional photographer, and is one of the finest RAW data development software. They continue to offer free upgrades, as they continually improve the software. This is a very different choice because this software is designed solely to create HDR images. However, at the same time, it possible to extend the dynamic range even from one RAW file. I have to drop DxO from my test. Version 3 was painfully slow, so I typically went to Silkypix, as I could get very good results with it. With hopes that an upgrade to DxO would speed things up, I tried to update DxO. The updater page was gone and there was no way to upgrade (even following their convoluted steps of going from version 3 to 4 to 5). DxO needs to get their act together on their versions and upgrade paths. They have already lost one customer. @27 Dec., 2008 - DxO updage web page now finely available. I could update at reduced rate from 3 to 5. However, develop result regarding grain aren't changed but speed are better now. Weird interface are little bit hard to get. Window display is not well-designed for smooth process. And, why have to use this even possible at Photoshop? Unfortunately I could not find anything better at DxO on Mac OS X. Maybe Ver.6?? Just one most big problem for DxO's way how that app corrects distortion are, have to have the lens data. For latest body, you have to wait until they will release the data file. Test source RAW data is same with old report. A Picture is worth a thousand words. When we look at the fine detail, Silkypix and Aperture are even. When see the dynamic range, Silkypix and Photomatix are even. I have to say Apple has done a great job for Aperture Version 2. 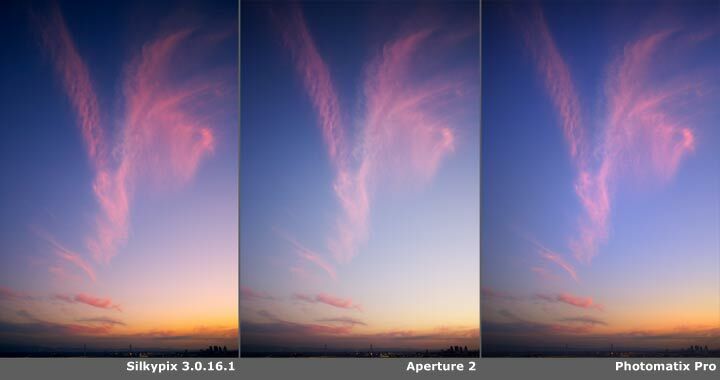 When we look at Aperture as tool to get the hard part of photography done, Aperture is a tool that really saves time. File folder naming problem for non-English versions are fixed too. Though everyone has a different work flow, Aperture 2 will appeal to many professionals, especially now with it's improvements. Photomatix Pro is an HDR generator software, but also can makes wide dynamic range from one RAW file, creating a Pseudo (fake) HDR image. When we compare this with Silkypix, Silkypix picks up very wide dynamic range but not with results like HDR. And of course, Silkypix does not include an HDR maker. So, we develop RAW on Silkypix or Aperture first, then merge it as an HDR image using Photomatix. This is the preferred method. If we are talking strictly about dynamic range, even as a Pseudo HDR, the dynamic range is remarkable. When we think about efficient post-processing (like working on the road), Aperture is the tool now because of version 2's great improvement. Process the resulting photos is quick as is burning to disk or publishing the data to a variety of other destinations. Of course if you are Windows user, there is no way to use Aperture. The problem with Silkypix now is that Aperture has caught up with them. It is a good product, but for the future, they have to do something like increase speed, make the interface better and, include other features like publishing to the web. I appreciated to their free upgrade until this stage. However, it might be time to make big change (even if this means that the users need to pay for the next version). In Japan, Silkypix is the de facto standard RAW development software. Now that Aperture includes improved grain quality, the competition for others is increasing. What will Silkypix do to improve their software? That's a big question. Maybe include HDR functionality, or make less noise and push the exposure envelope. At this time, I would like to make a standing ovation to Aperture 2. It is because Apple listened to users carefully and responded by improving Aperture for the pro photographer. Even if Photoshop releases a free online software, professional photographers need a stand-alone RAW developer. It is a part of our digital toolkit. This is our digital darkroom, and it is as important as the old film lab was to traditional film photographers.